I stumbled across this recipe one day when I was digging through Diane Duane’s tumblr looking for something else (I no longer remember what). As soon as I saw it I knew I wanted to make it. It’s associated with a 2013 piece of fanfic for the TV series Sherlock (itself a pastiche of the Sherlock Holmes stories set in modern-day Europe), which Diane Duane also calls Mycroft’s Delight — the Mycroft of the title is of course Mycroft Holmes, Sherlock’s older brother, who (in the Canon) Sherlock says is smarter than himself. I don’t watch the TV series, so I don’t know the background that this fanfic is fitting into, but Duane describes its origin as being based on a cake she ate in Sedrun, Switzerland, called “Urner brenntweintorte“, her reconstruction of which is more verbosely called “Double Chocolate Courvoisier Torte with Brandied Buttercream Filling and Two Icings (Brandied Nutella Frosting and Cream Cheese & White Chocolate Ganache Glaze)”. As the author cautions, this cake takes the better part of a day to make (even more so that your typical layer cake, due to the multiple layers of frosting). I tried to keep track of the timing but kept forgetting to start the timer, buy based on the timestamps in my photos it took about four hours (not counting ingredient shopping). There are a few different options for how this cake is put together. In her tumblr post, Duane says that when she had the original in Switzerland, it had six very thin layers. 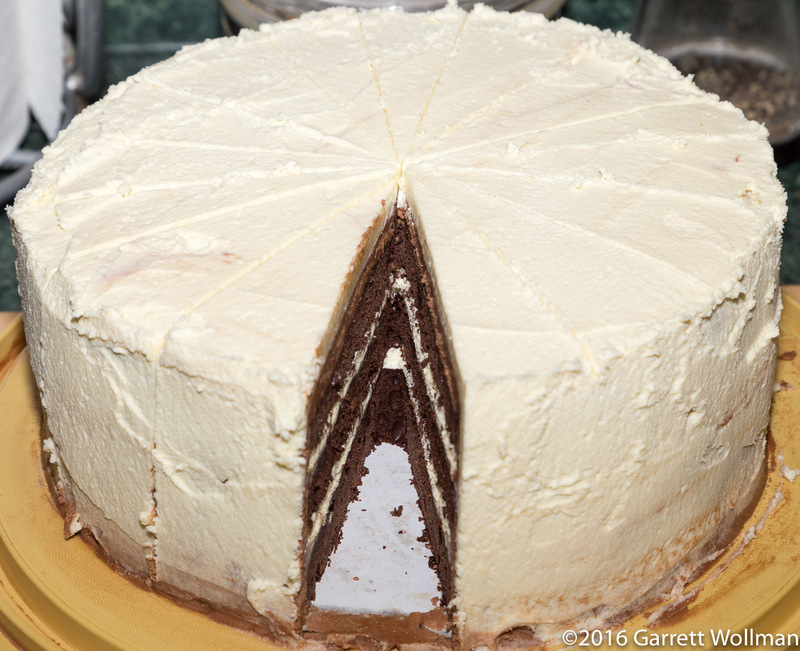 Her photo shows a nine-inch, four-layer cake, but the recipe as written is for an eight-inch, three-layer cake, and that’s how I made it. 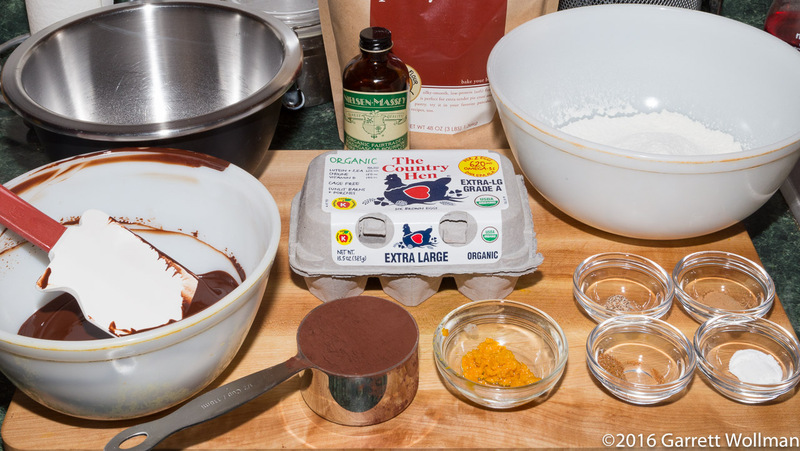 When I looked closely at the recipe, despite a few unusual ingredients, I immediately said to myself “Oh, this is a chocolate genoise, I know how to do that”. It didn’t come out quite as I expected, and I think there are a few ways it could be improved, which I’ll discuss below — and since I still have more than half a bottle of Courvoisier left over, there’s no reason I can’t try a few variations later this year to see if my intuition is worth anything when it comes to cake baking. We start, of course, with the mise en place. I managed to screw up the cropping on this photo so a few things are not quite visible, but I’ll go over everything as I usually do. 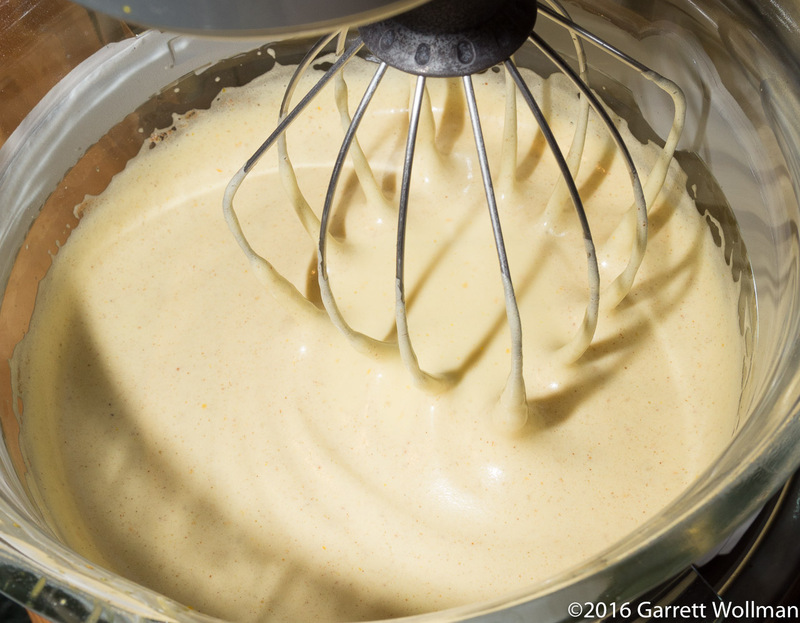 This being a genoise, we start with lots of eggs: the recipe calls for six “large” eggs, but as the author herself noted in a 2015 tumblr post, UK and Irish egg sizes are larger than everyone else’s. US and European “large” eggs are 50 g on average; UK/IE “large” and US “extra large” eggs are 2 oz or 56 g, so I used six extra-large eggs. 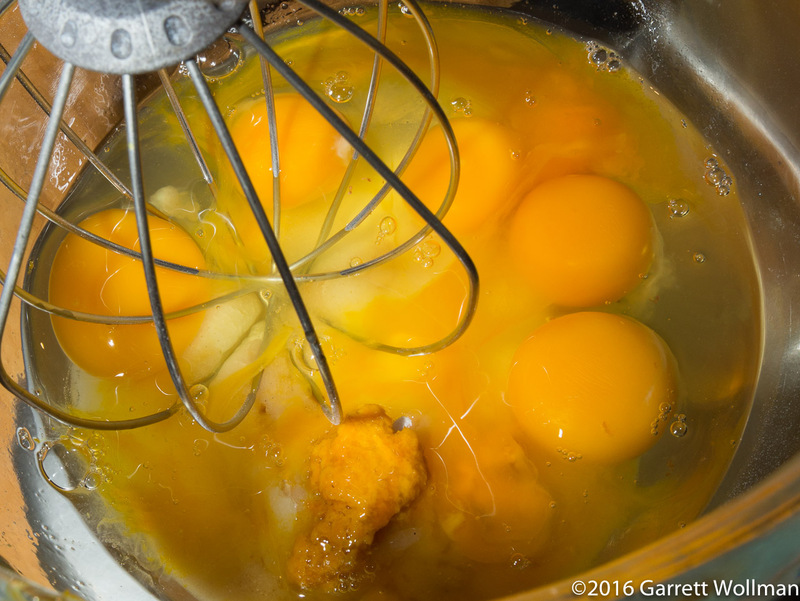 As you’ll see, the batter ended up a bit stiff and dry, so in a future attempt I might either go all the way to “jumbo”, or more likely, add another egg (or maybe even just an extra yolk or two, since egg whites dry out baked goods). Hidden in the stainless-steel bowl is 1 cup (195 g) of superfine sugar (called “caster sugar” on those islands off the northwest coast of Europe). Other wet ingredients are a teaspoon of vanilla extract, a half-teaspoon of orange extract, a teaspoon of freshly grated orange zest (which has been mashed up with a mortar and pestle), and four ounces (110 g) of unsweetened chocolate baking wafers (I used Madécasse), melted in the microwave and cooled. Duane specifies “1 cup flour” to anchor the dry team; knowing that UK and Irish flour tends to be made with soft (low-protein) wheat, I chose to use pastry flour (I could have used cake flour, which is even lower-protein), but not knowing how Duane measures her cups of flour, I had to guess on the mass — I took my usual guess, 4½ oz, converted to grams and rounded to get 130 g. The other dry ingredients shown are half a cup (55 g) of Valrhona cocoa powder, half a teaspoon each of baking powder and cinnamon (I used true “Ceylon” cinnamon, not the Vietnamese cassia which is commonly sold as “cinnamon” in this country), a quarter-teaspoon of mace, and an eighth-teaspoon of freshly grated nutmeg. 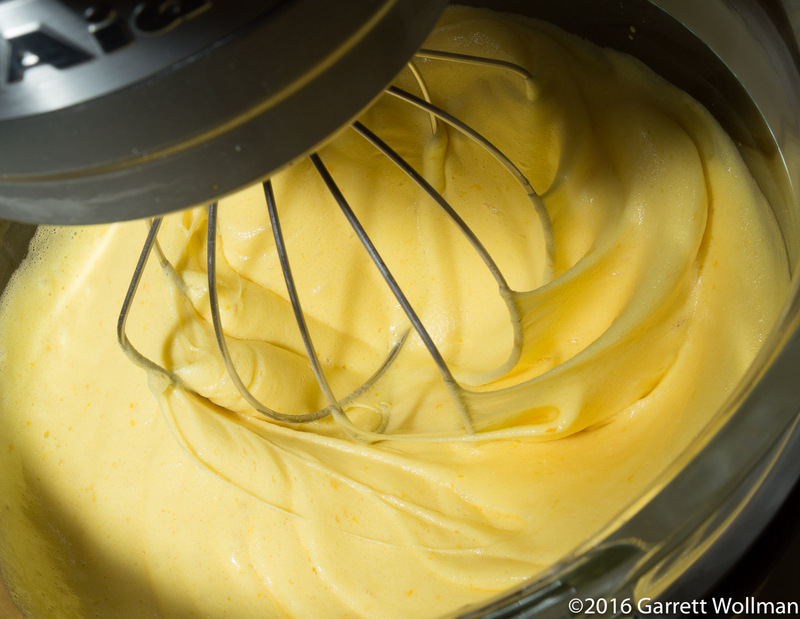 The genoise method starts by making an egg foam with whole eggs, sugar, and liquid flavoring ingredients — in this case, the mashed orange peel, orange extract, and vanilla extract. To get the eggs to the right consistency requires quite a bit of beating on fairly high speed. 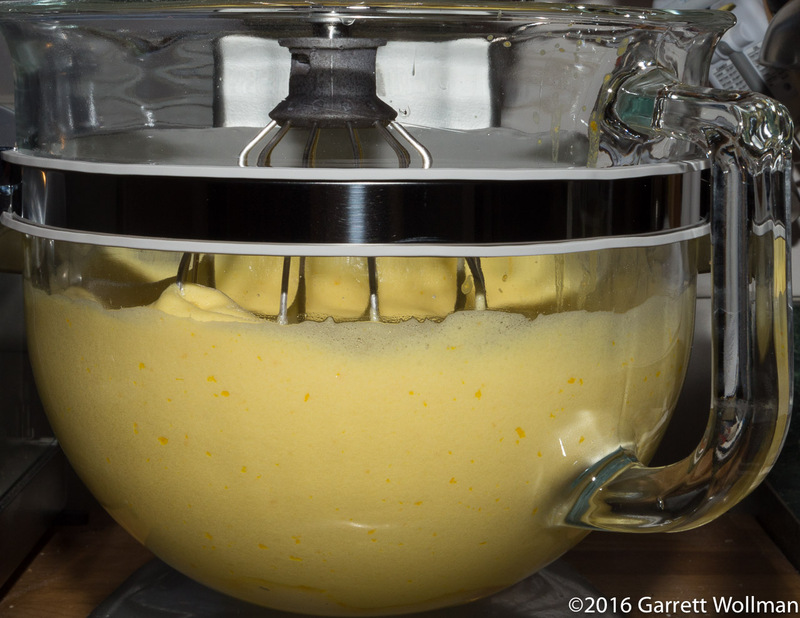 After about three minutes in the KitchenAid at medium-high (about a 6 or 7 on mine), the egg-sugar mixture has grown about 25% in volume and still looks bright yellow from the egg yolks. As I was saying, the eggs need to triple in volume, or even more. Once you start adding the fat (melted chocolate) and flour, this foam will deflate substantially, so you need to start with quite a lot of air bubbles for the final cake to be something more than a chocolate pancake. In any event, the three eight-inch layers came to about 265 g each, after accounting for the batter that inevitably remains stuck to the work bowl, beater, spatula, and so on. These are really thin layers — so much so that I might well be inclined to do a Joanne Chang and bake them as a single cake in a taller pan and then split it into layers after cooling. The pans have been prepared with (a bit too much) baking spray and parchment rounds, and are surrounded with fabric cake strips, just in case they rise more than seems likely. The cake batter is quite thick and a little bit lumpy; it was very difficult to spread out in the pan, even with an offset spatula, as it slid around on the bottom of the pan. Doing it this way, the layers bake for only a short time, just 15 minutes, at 350°F (175°C). 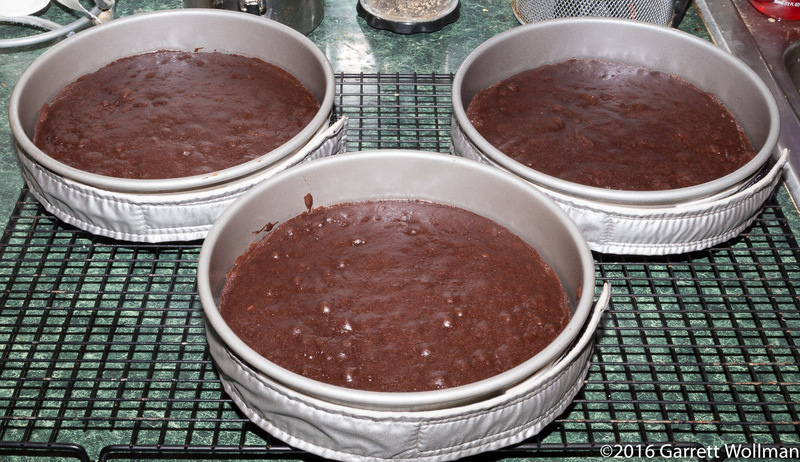 Fresh out of the oven, with these glossy tops it’s tough to tell the difference between the raw cake layers and the fully cooked ones — but if you look carefully you can see that the cake has pulled away from the sides of the pans. You can clearly see how thin these cake layers are. After about 15 minutes, they are removed from their pans to completely cool on the rack, which only takes about half an hour. Here’s another place where I neglected to take the requisite photos. As is normally the case with a genoise, the cake itself is quite dry and needs to be brushed with a sweet syrup to moisten it up — since there is so little fat in a genoise, it doesn’t have the mouth feel that we interpret as “moist” (which in baked goods usually comes from liquid fats rather than actual moisture). The recipe here calls for boiling ¼ cup (50 g) of sugar together with ⅓ cup (80 ml) of water for five minutes, then letting it cool and stirring in two tablespoons of Courvoisier: when I let the syrup cool, it nearly solidified on the bottom of the pan — I ended up putting it back on the burner just to get the cognac to combine with the “syrup”. In retrospect, it probably needed a bit more liquid, or a bit less cooking time. 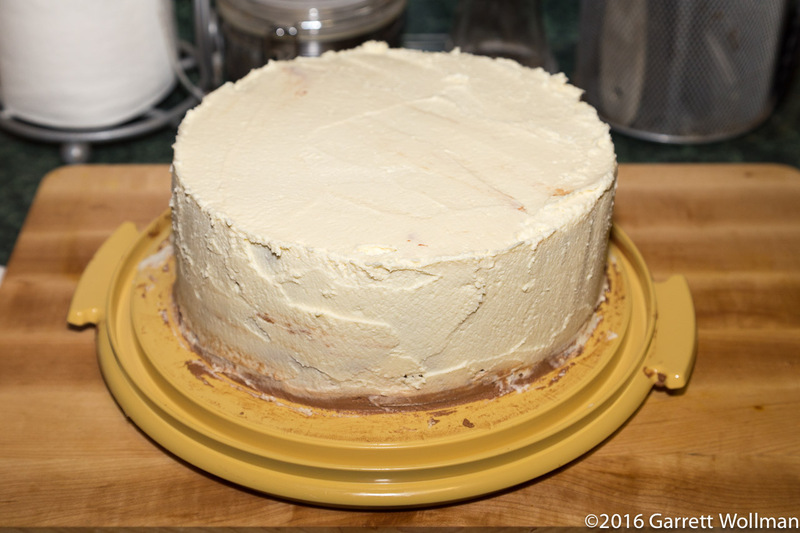 I put the layers onto individual cardboard rounds because I wanted to depart slightly from the recipe here, but following standard genoise layer-cake procedure, by freezing the layers once they soaking syrup has been applied. This makes it easier to assemble the layers, and also helps the filling and frosting to solidify, making it less likely that the frosting will slip off or slump. Now on to the filling/frosting. You can tell that this is a European recipe as it includes raw egg yolks, something which would never appear in a modern US setting for fear of (lawsuits over food poisoning caused by) Salmonella. Although the microbe is endemic in the US poultry industry, European strains of Salmonella have not yet gained the ability to infect hens’ ovaries, so European cooks are much more nonchalant about using uncooked egg products than we are. (The actual risk of Salmonella infection from organic US eggs is still quite low, about 1 in 20,000, and pasteurized shell eggs are available for those who have reason to be concerned. As always, it’s best to buy fresh food from reputable suppliers that treat their animals to a better-than-the-legal-minimum level of care.) 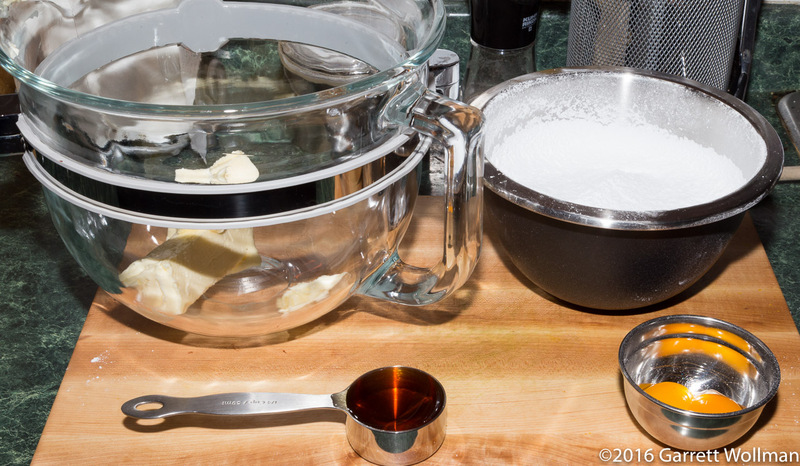 The other ingredients in the frosting are confectioners’ sugar, 150 g of softened unsalted butter, and a quarter-cup (60 ml) of Courvoisier. The recipe calls for “3 cups” of the powdered sugar, and again there is a measurement problem, but I found when I used the dip-and-sweep method that one cup weighed out to almost exactly the 120 g that I computed from the nutrition label — so weigh out 360 g total confectioner’s sugar. (Also called “icing sugar”, confectioner’s sugar is powdered extremely fine and is mixed with up to 2.5% cornstarch as an anti-clumping agent.) Always sift powdered sugar before using to remove the lumps, but if you’re measuring by volume, check the recipe to see if it calls for sifting before (unusual) or after measuring. 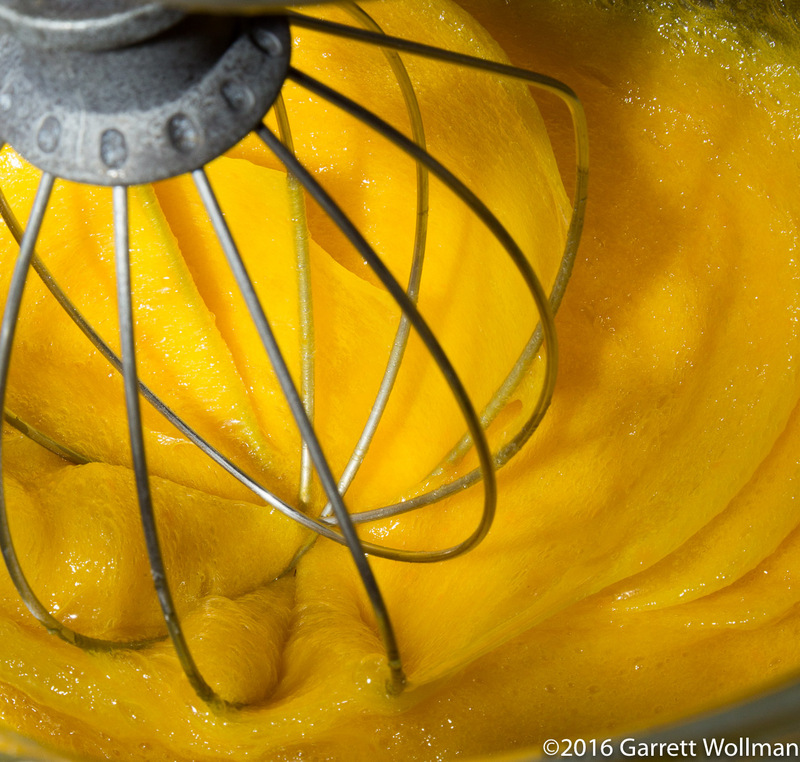 As with the egg foam base of the chocolate genoise, the egg yolks initially give the frosting a bright yellow color. Extended agitation denatures the egg proteins and causes the color to lighten; this shows the prepared filling/frosting after ten minutes of beating, when it has attained a lovely light yellow color (and hopefully any pathogenic bacteria have been inactivated by the inhospitable mixture of sugar and alcohol!). 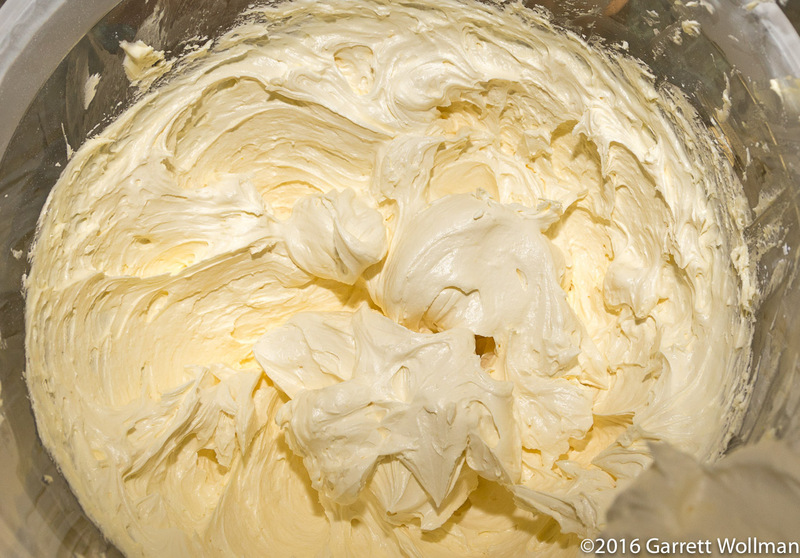 This frosting is going to be divided in half, and the first half will then be divided again to make the filling for the cake layers. Since I’m not good at estimating volumes visually, I took the effort to weigh out the frosting on my scale. 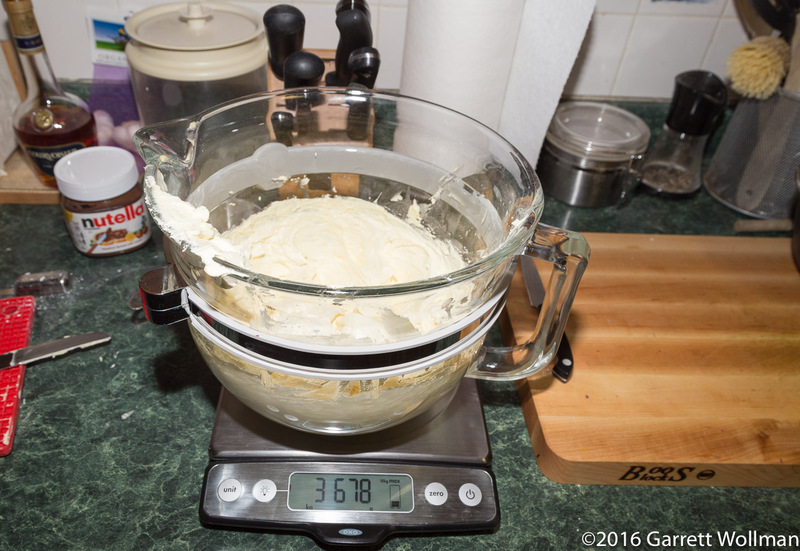 The tare weight of my mixer’s work bowl is 3.1 kg, so the total yield of frosting is 580 g — divide that by two to get 290 g of filling, which I transferred to a separate bowl; the remainder stays in the mixing bowl to make the “side frosting”, described below. 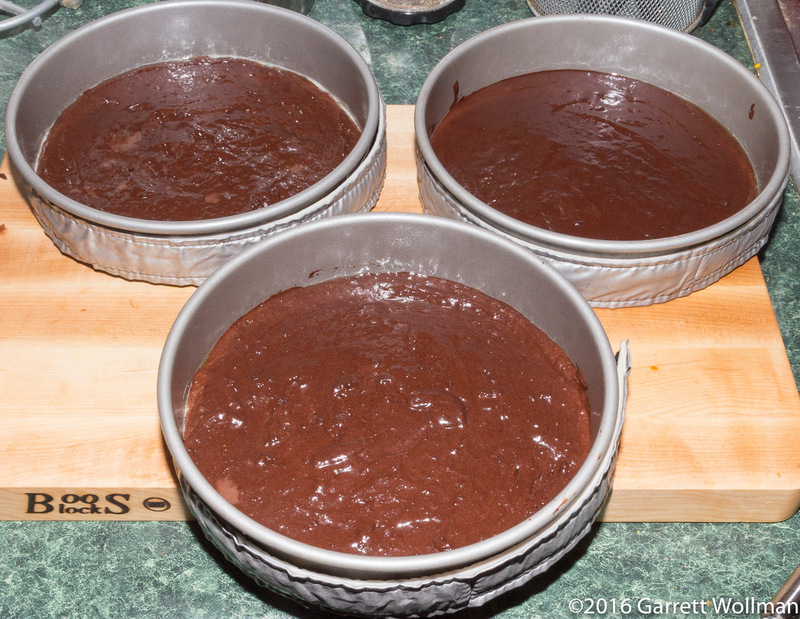 I took the first cake layer out of the freezer and applied half (145 g) of the filling to the top side. 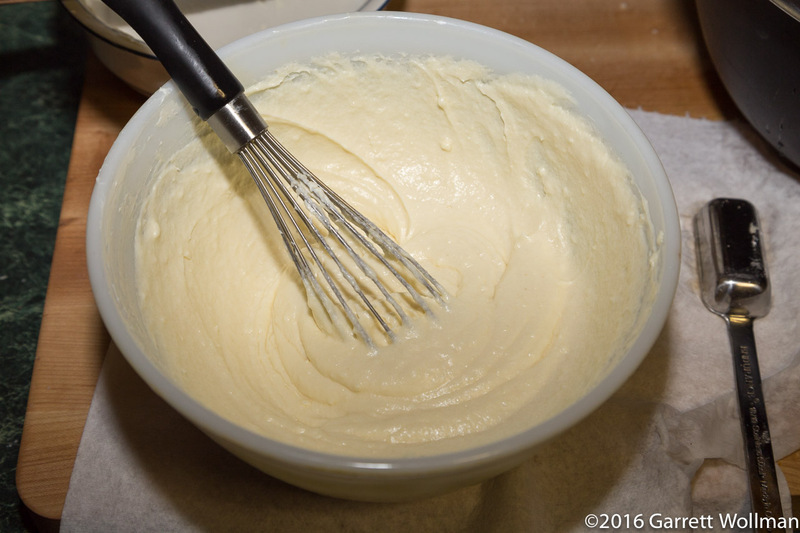 It began to set up almost immediately, as the room-temperature butterfat of the filling came into contact with the cold genoise. I proceeded to top the middle layer with the rest of the filling in the same fashion (still on its own cardboard cake round for the time being). 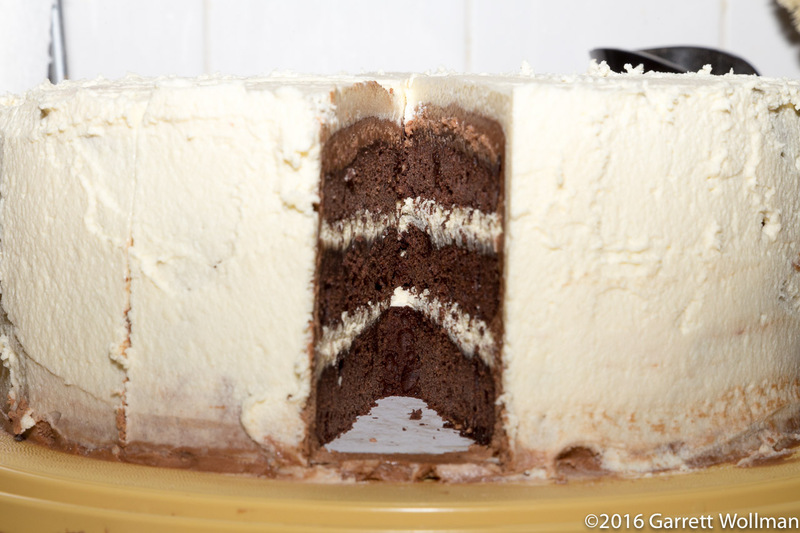 I then stacked all three cake layers and pressed the top layer firmly down to fully bed the bottom of each layer into the filling atop the layer beneath it. Well, OK, maybe this wasn’t quite the most even or level set of cake layers. Another point for baking in one pan and splitting after. Time for another photograph-free interlude. The remainder of the filling/frosting mixture is turned into the “side frosting” of this cake with the addition of a few more ingredients: four ounces (110 g) of Nutella, slightly warmed; two ounces (55 g) of melted milk chocolate — I used Valrhona Jivara, as one does; two teaspoons of cocoa powder (I used TCHO natural cocoa for this part); and another tablespoon of Courvoisier. The recipe allows for either milk or dark chocolate, but I felt that the milk chocolate would be a better match for the buttery frosting and Nutella. If I had it to do all over again, though, I would probably have done it a bit differently: either using pure hazelnut paste in place of the Nutella, or just melting six ounces of Valrhona Noisette gianduja instead. (Both of these options are a bit more difficult for me at the moment, but I will have to make hazelnut paste for another recipe in a couple of weeks anyway — since this standard Italian ingredient is not easily available even in Boston — and Whole Foods has stopped carrying most Valrhona products including the gianduja. Nutella at least has the advantage of being readily available to pretty much everyone, although I remember not that long ago it was confined to the “foreign” aisle in the supermarket if you could even find it here; now there are multiple competing manufacturers of chocolate-and-hazelnut-flavored-sweetened-palm-oil spreads.) In any event, Duane says “if you have enough” (I got 475 g) “to frost ther whole top without the side frosting being too thin, that’s great”; what I had was plenty, so that’s what I did. The next part seems a little bit goofy to me. I stuck the frosted cake into the refrigerator (covered, of course) while I worked on what Duane calls “white chocolate ganache and cream cheese glaze” and I thought of as sur-frosting. This starts with four ounces (110 g) of chopped white chocolate — Callebaut coverture is what’s most easily available to me, since the Valrhona is no longer carried at Whole Foods — melted in the usual way with a third of a cup (80 ml) of very hot heavy cream. As I’ve noted before, I’m pretty much crap at smoothly frosting a cake, so this is what it looked like when I was done. Could have been better, without a doubt, but I was reaching the end of my patience anyway, and dinner was waiting for me on the counter. I stuck the finished cake back in the fridge to set up completely. As is my usual practice, I cut the cake into sixteenths. I’ve found that portioning the whole cake at once tends to cause it to slump, particularly as the frosting and filling approach room temperature, so I marked the top of the cake with a warm chef’s knife for all sixteen slices, but only actually cut the first quarter — just enough to extract one clean slice for photography purposes. And that’s what my one slice looked like. 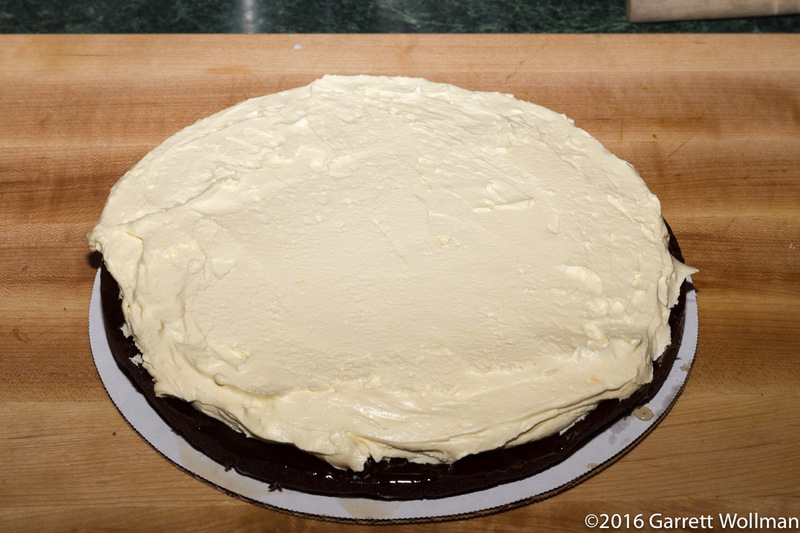 Sue Felshin commented that this cake was a bit dry, and I agree: I think it needed more soaking syrup, and probably also more surface area for the syrup to soak in. (Again, baking it as a single layer and then cutting would have fixed that.) It was still very tasty (although Sue preferred my birthday cake), and had a great flavor of cognac that was not at all boozy. Everyone liked it, but a few of my usual tasters were unavailable, so I actually had a couple of slices left over. And there’s the cross-section. 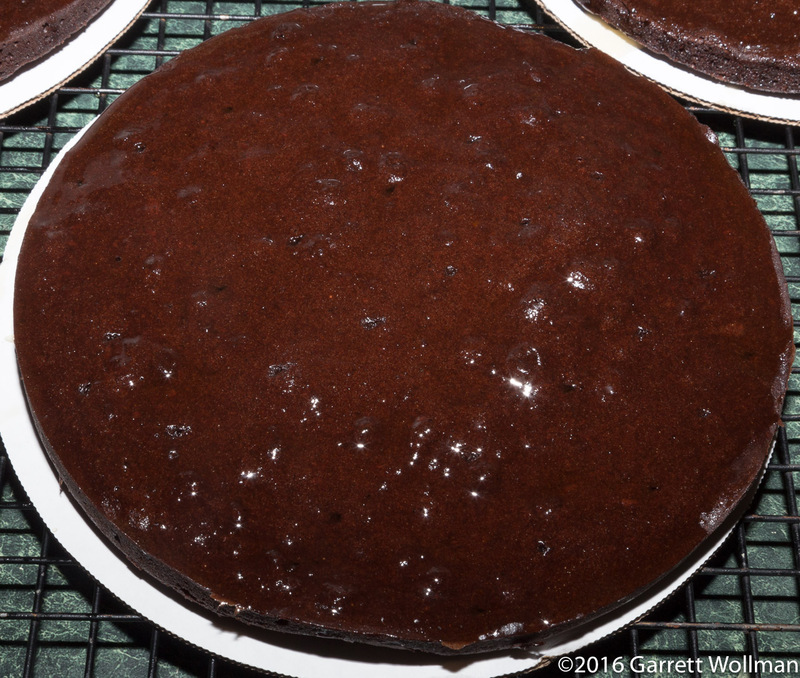 Even though the layers looked exceedingly thin going into and then coming out of the oven, the fully assembled cake is plenty tall. Still, I have a few ideas about how I might modify the recipe somewhat: perhaps using cake flour instead of pastry flour; perhaps adding another egg yolk to loosen up the chocolate; perhaps adding another whole egg, or at least the white, to increase the volume of the egg foam a bit more; very likely using a different white-chocolate glaze that is actually glaze-like; maybe doing the four-layer nine-inch version; probably playing around with the flavorings added to the frosting. I’ve still got more than half of that bottle of Courvoisier, and all the other ingredients are standard supermarket fare, so there’s plenty of opportunity to experiment — if I can find the time and enough tolerant tasters. 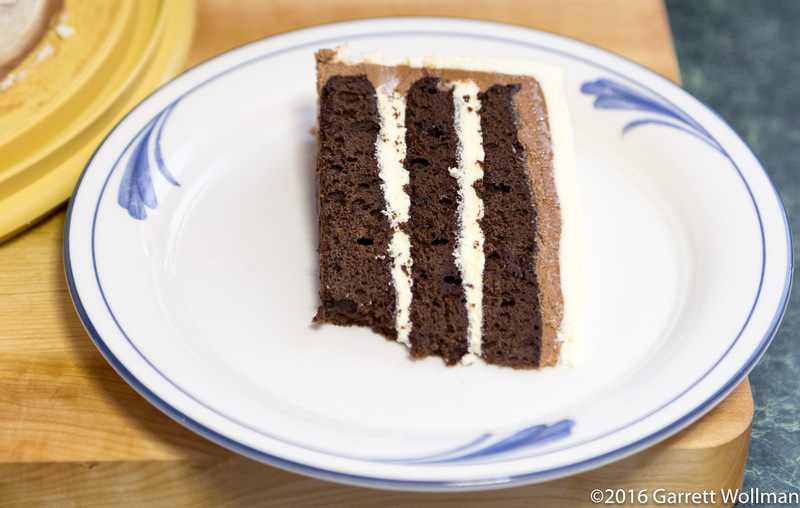 For a frosting-filled three-layer cake this really isn’t bad at all. I’ve done cakes of a similar size with a much higher calorie toll, on the order of 800–1100 kcal per serving. I am of course assuming that you can limit yourself to the fairly small slices I call for here. 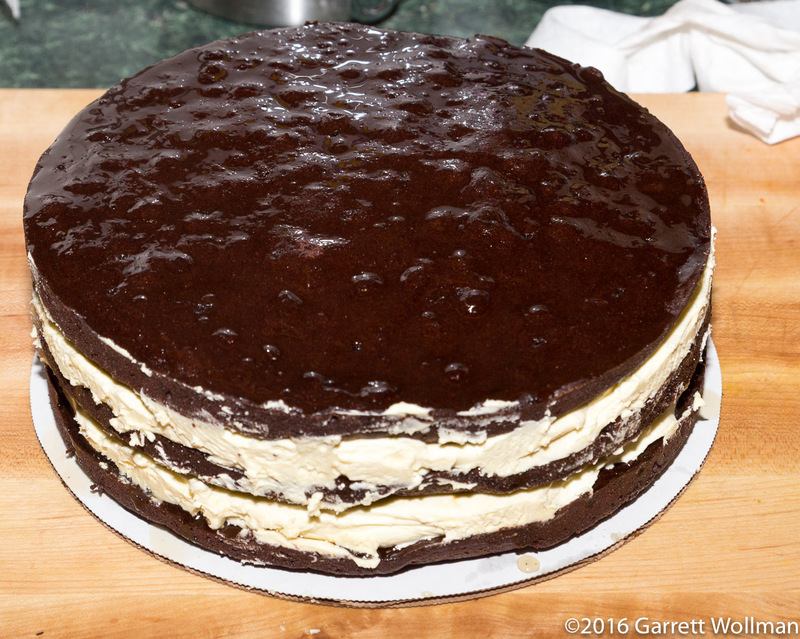 Gallery | This entry was posted in Food and tagged cake, chocolate cake, Cognac, Diane Duane, milk chocolate, Nutella, recipe, Switzerland, torte, white chocolate. Bookmark the permalink.